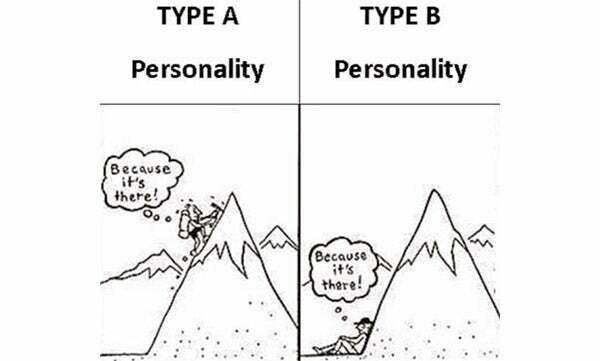 Most think of Type A people as driven and highly strung and Type B people as carefree and even-keeled, but there's so much more to it. We each have our own understanding of what it means to have a Type A personality, but what does this term really mean and where did it come from? It actually started in a waiting room shared by a pair of cardiologists. The doctors noticed that their chairs didn’t have wear on the backs as expected -- the wear was only visible on the front edge of the seats and the armrests, suggesting that patients were literally waiting on the edge of their seats, ready to jump up the second their names were called. So, the cardiologists -- Doctors Friedman and Rosenman -- wanted to find out if the strange wear pattern on their chairs was because impatient people are more prone to heart disease. They discovered that their hunch was correct. They also found that people’s personalities tend to lean in one of two directions, which they labeled Type A and Type B.
We’re really hard on ourselves. Our desire to do our best often morphs into a desire to be the best. After all, if someone else does something better than us, then we mustn’t have been trying hard enough, right? This ensures that even the most mundane activities become a competition. We don’t do anything “just because.” There’s an end aim for everything. That morning cup of coffee? The goal is to wake up. Half an hour of Pokémon Go at lunch? It’s about squeezing in some exercise and capturing more Pokémon than our friend down the hall. Heaven help anyone who slows us down or gets in our way. We’re nothing if we don’t reach our goals. Achieving our goals is so important to us that we often get stressed out about our progress. It’s that specter of wasted time or missed opportunities hanging over our heads that gets us all riled up. It may seem hypocritical that we’re sometimes late even though the rest of the time we’re impatiently drumming our fingers, waiting for meetings to start on time. The problem is that we try to squeeze a task into every possible minute, and sometimes we overdo it. In our determination to avoid downtime, we sometimes inadvertently create downtime for other people. Skip the long preamble; if we have questions, we’ll ask. There’s no need to waste time on the setup when you have something important to tell us -- just tell us. The theme here is efficiency; we’re interested in hearing the main points so we can begin taking action. We don’t hate being stuck at a red light or cooling our heels in a doctor’s waiting room because we think we’re too good to wait. We just like to be efficient with our time and don’t like things getting in our way. Every minute spent waiting is a minute we could have spent doing something productive. It’s a minute that we’ll never get back. Like “later,” “good enough” isn’t part of our vocabulary. Things are either right or they’re wrong. And they always, always have to be right. No matter what we’re doing, we care too much to settle for mediocrity. We’re not being rude, and we’re not bored. We just have a sense that the value of our day is measured by how much we get done, and we accomplish more when we do two (or more!) things at once. Relaxation isn’t a measurable goal, and it feels like a waste of time when nothing is getting done. It’s very difficult for us to sit around and “just be”; instead, we prefer to be actively “becoming” whatever lies at the end of our current ambition. Anything else amounts to lost time. From our perspective, “now” is the only time that exists. There’s no sense in putting something off till another time. While that’s often a good thing, we tend to give trivial issues a greater sense of urgency than they deserve. Our time is carefully orchestrated so that each day we accomplish what we intended. Again like “later,” “whenever” isn’t part of our vocabulary. Everything gets scheduled and added to lists, and we take great satisfaction in ticking all the boxes. Our motors are always running, so when we have to idle, that excess energy manifests in various nervous habits, such as fidgeting or biting our nails. Don’t worry, we’re not freaking out. This is normal behavior for us. We know that we can be awfully hard on everybody, but we’re even harder on ourselves. This may be difficult to see because no one else is privy to the perfectionist that’s goading or berating our every move inside our heads. Just know this: We care --we care a lot -- and we really are sorry if our personality makes us hard to get along with sometimes.